For American teens, making friends isn’t just confined to the school yard, playing field or neighborhood. 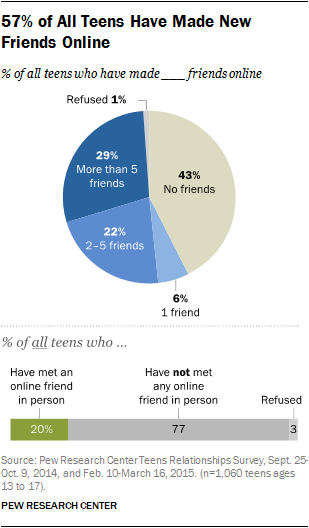 More than half (57%) of teens say they have made new friends online: 6% have made just one friend, 22% have made between two and five new friends, and 29% have made more than five new friends online. Relatively few of these digital friendships yield in-person friendships; only 20% of teens who have made an online friend have met that friend in person. Boys are more likely to make friends online than girls: 61% of boys and 52% of girls say they have made at least one friend online. Perhaps because they have spent more time online and have become more familiar with digital platforms, older teens are more likely than younger teens to have made friends online: 60% of those ages 15 to 17 vs. 51% of those ages 13 to 14. 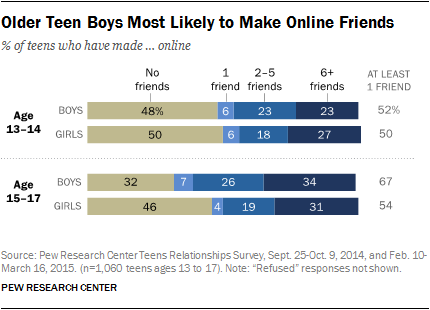 Older boys are especially likely to have made friends online (67% have done so). Hispanic teens (64%) are more likely than whites (53%) to have made friends online. Among black teens, 57% have connected in this way. Occasionally, meeting people online is not a positive or comfortable experience for teens. One high school boy described his experience. Male: Yeah, I had an incident. Someone kept like trying to message me, asking me for my name and asking me for my Facebook. I gave it to them and they were sending me weird pictures. Interviewer: So somebody tried to become your friend and that was really weird. Teens’ access to — and use of — various technology platforms is tightly linked with their tendency to make friends online. Specifically, teens who use networked online environments like gaming or social media platforms tend to be more likely to make friends online than other teens. Fully 72% of all teens ages 13 to 17 play video games on a computer, game console or portable device. Teen gamers play video games in a variety of ways and with a variety of companions; 83% play with others in person and 75% play with others online. Teens also play with friends they know in person (89%), friends they know only online (54%) and online with others who are not friends (52%). In the gaming context, teens who play games online with others — especially those who do so on a regular basis — are more likely than other teens to make friends online, and are also more likely to make a large number of online friends. 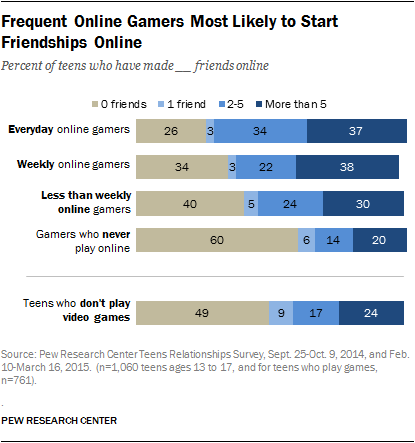 Among those who play games online with others daily, roughly three-quarters (74%) have made friends online and 37% have made more than five friends online. By contrast, among teen gamers who never play with others online, just 40% have made any friends online, and only 20% have made more than five friends online. When it comes to social media — another major networked environment in teens’ lives — teenage social media users are more than twice as likely as those not on social media to have made online friends (61% vs. 23%). And, as is the case with gaming, social media use is heavily correlated with making a relatively large number of friends online. Fully 31% of teen social media users have made more than five friends online, compared with just 10% of teens who do not use social media. Finally, teens with access to a smartphone are more likely than other teens to make friends online. Six-in-ten teens with smartphone access (60%) have made friends online, compared with 48% of those who do not use smartphones. Teens use an array of online sites and digital platforms that facilitate meeting and interacting with new people, including discussion boards, social media platforms, networked and online video games, online video sites and blogging sites, among others. In addition to asking whether they have made friends online in a general sense, the survey also followed up and asked teens where they have met new friends by asking about a number of specific platforms and venues. As noted above, teens who spend their time playing video games online with others or using social media are more likely to make new friends online in general. These same venues emerge as the most common locales for making and developing friendships online. 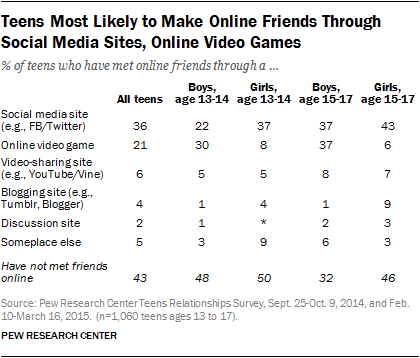 Among all teens, 36% have made friends on a social media site like Facebook or Twitter, while 21% have met someone while playing a video game online. Some 6% of teens have met friends through a video-sharing site like YouTube or Vine, while 4% have done so on a blogging site like Tumblr or Blogger. For girls, social media sites are the dominant way to meet friends online. Fully 41% of all girls have made friends through Facebook, Twitter or another social media site. Some 43% of older teen girls, ages 15 to 17, have done so, as have 37% of younger girls, ages 13 to 14. Small shares of younger and older girls have met friends in any other forum, although 9% of older girls have met friends on a blogging site. While many teen boys also make friends on social media sites (31%), they are substantially more likely than teen girls to make friends while playing video games online. About one-third of all teen boys (34%) have met friends while playing a video game online, compared with just 7% of teen girls. Boys are about equally as likely to make friends through gaming as they are to make friends through social media. Among teen boys, 31% have met friends through social media, and a similar share (34%) has met friends through an online video game. Black teens are more likely than white teens to have made friends through a social media site (45% vs. 32%). Among Hispanic teens, 39% have made online friends that way. Black teens are more likely than either whites or Hispanics to have made friends on video-sharing sites: 14% of black teens have done so, compared with 4% of white teens and 6% of Hispanics. There are few other significant differences by race and ethnicity around the places teens meet friends online. 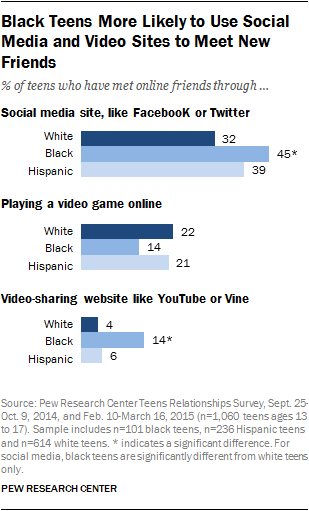 About two-in-ten white teens (22%) and Hispanic teens (21%) have made friends playing online video games, which is not significantly different from the share of black teens (14%) who have met friends while online gaming. A previous Pew Research study of teens found that smartphones are facilitating deeper interactions with a range of online content. This new study finds that teens with smartphone access are more likely than those without a smartphone to have met friends in a variety of online venues. Smartphone-using teens are more likely than teens without a smartphone to have made friends online whom they first met through a social media site (39% vs. 28%) or online video games (23% vs. 16%). Additionally, teens from families with annual household incomes of less than $50,000 are more likely than those with higher family incomes to report making friends on social media sites (42% vs. 33%). A substantial majority of teen friendships that begin online remain exclusively online. Overall, 57% of teens have made at least one friend online and just 35% of that group have eventually met their online friends in person. 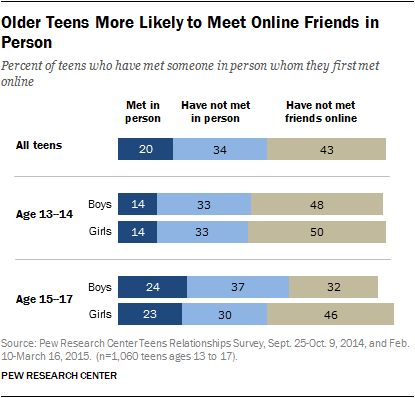 In total, 20% of all teens have met someone in person whom they first became friends with online. Overall, boys and girls are about as likely to have met someone face to face whom they first befriended online (20% for boys and 19% for girls). Older teens are more likely than younger teens (24% vs. 14%) to have met someone in person after becoming friends online. Although boys ages 15 to 17 are the subgroup most likely to have made friends online, they are not significantly more likely than girls of the same age to have met people in person with whom they first connected online (24% vs. 23%). To solidify a new friendship, individuals exchange information so they can stay in touch. Teens today have an array of communication tools at their fingertips to choose from when figuring out how best to stay in touch with a new friend. For the largest number of teens, the first item they share is their phone number, with the expectation that friends will text them. When meeting a new friend they might want to keep in touch with, 80% of teens share a phone number so their friend can use it to text or message them. For 54% of teens, a phone number to text is the first piece of contact information they share with a potential new friend. About half of teens (52%) indicate that a phone number for calling is one of the first three things they would share with a new friend, but just 9% indicate that this is the first thing they would share. Roughly six-in-ten (62%) share a social media username with a new friend, and nearly four-in-ten (39%) share an email address. Teens with access to a smartphone are more likely than other teens to share their phone number for texting (89% vs. 58%) as one of the first three pieces of information they share with a new friend. Teens with smartphones are also more likely to share a social media username (65% vs. 54%). On the other hand, teens without smartphones are more likely to share their email address with a new friend (48% list this as one of the first three things they would share, compared with 36% of smartphone users). 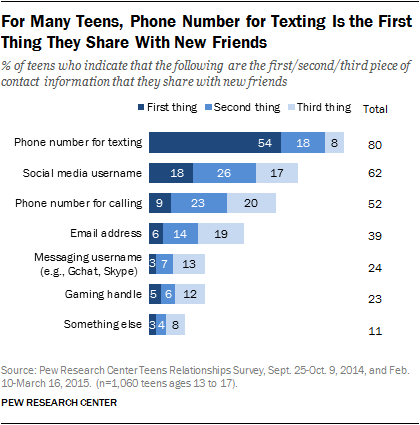 The contact information that teens first share with new friends depends somewhat on their age and gender. Sharing a phone number for texting is the top response for teens of all ages, but boys ages 13 to 14 are less likely than others to do so: 70% of them share phone numbers for this purpose, compared with 80% or more of girls ages 13 to 14 and older teens of both genders. Sharing a social media username as a way to get to know a new friend is more common among girls (65% list this as one of their top three things, vs. 58% of boys) and among older teens (66% among those ages 15 to 17 vs. 54% for those ages 13 to 14). Girls also are more likely than boys to share a messaging program username as one of the first three things they share with a new friend (29% vs. 19%). 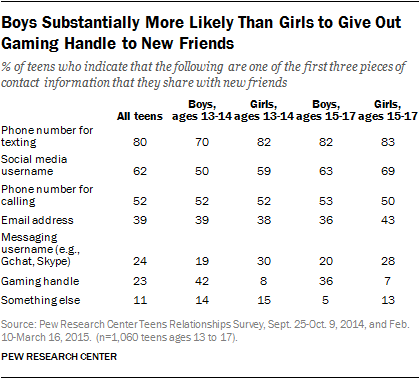 On the other hand, boys are about five times more likely than girls to share a gaming handle as one of the first pieces of contact information they give to new friends (38% vs. 7%). Fully 42% of younger teen boys and 36% of older teen boys share their gaming handles initially, compared with 8% of younger teen girls and 7% of older teen girls. Teens are about equally likely to share a phone number for calling or an email address, regardless of gender or age. Girl 1: Oh yeah. Like if you’re friends with them, you kind of like search through their pages to see what kind of person they are. Girl 2: Yeah. That’s probably a big indicator for me, too, to actually feel the need to give them my real number. You have to stalk their account [and see] they’re not like a loner creeper person. Once teens have established a friendship, they weave mobile, social and gaming technologies into their patterns of communication and interaction. Teens have a variety of options at their disposal when it comes to spending time with friends – from the classic face-to-face chats, to phone calls, to exchanges on social media platforms, video games, video chat, email and an array of different messaging choices. Despite concerns that teens are constantly buried in devices, they do spent many hours a day in face-to-face, in-person communication in school. This study focused on in-person interactions outside of school, where teens have more control over how they interact with friends and peers. Virtually all teenagers (95%) say they spend time with friends in person outside of school, but they do not necessarily spend time with them on a daily basis outside of school. Among all teens, a quarter interact with friends outside of school every day, 39% say they do so every few days, and about a third (32%) say they do so less often. Another 4% say they never hang out with friends in person. Some 85% of teens say they spend time with friends by calling them on the phone, and 19% do so every day. But another phone-based activity — text messaging — is done much more frequently. Some 88% of teens use texting to connect with friends (similar to the share that does so via voice call), but more than half (55%) of teens say they text their friends on a daily basis. That makes text messaging — by a substantial margin — the most popular choice for teens’ daily communication with friends. 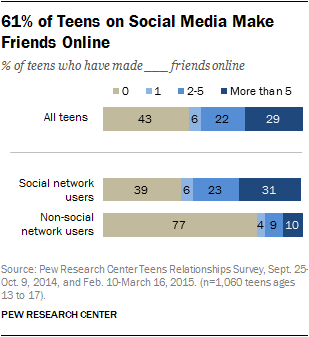 Social media: 71% of teens spend time with friends on social media; 23% do so every day. Video chat: 59% of all teens video chat with their friends; 27% video chat with friends daily. Messaging apps: 42% of all teens spend time with friends on messaging apps, such as Kik and WhatsApp; 14% do so every day. And when we asked teens in our focus group about what they were talking about with friends through messaging or social media, we got a variety of answers. One high school boy told us that he and his friends ask each other questions like: “How is life? How have you been? What have you been doing?” Another boy in the same group stated his topics of conversation with his friends succinctly as about “females.” A middle school boy talked about “sports and games” when talking through social media or video games. Others, including a number of girls, noted the prevalence of “gossip” as a major topic of online conversation. Teen girls are somewhat more likely than boys to text friends in general and are substantially more likely to text friends every day: 62% of girls do so, versus 48% of boys. In fact, 15% of boys never spend time with friends using text messaging. Social media is also an important digital channel through which teens communicate with their friends — 72% of teens (and 94% of social media-using teens) say they spend time with friends by posting on social media sites. Some 23% of all teens say they connect with friends this way every day, while 28% do so every few days. Teenagers from lower-income households — those with annual income below $50,000 — are more likely to interact with friends every day through social media than teens whose annual household income exceeds $50,000 (29% vs. 19%). A similar share of social media-using boys and girls say they spend time with friends over social media. Some 42% of all teens (and 48% of cellphone users) use messaging apps like WhatsApp or Kik to spend time with friends, and 14% do so every day. A slightly greater percentage of girls (46%) than boys (38%) use messaging apps to spend time with friends. There are also racial differences in messaging-app use. About half of black (52%) and Hispanic (50%) teens use messaging apps to communicate with friends, compared with 37% of white teens. Daily use also is strong among minority teens — while only 10% of white teens use messaging apps to communicate with their friends every day, this figure increases to 19% among Hispanic teens and 28% among black teens. Instant messaging is another digital tool teens use to hang out with each other. Some 79% of teens instant or online message their friends, with about a quarter (27%) doing so every day; 26% do so every few days and 25% do so less often. 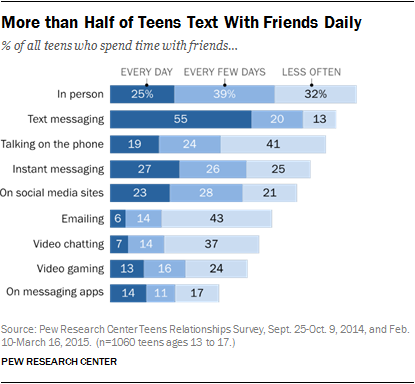 Older teens and girls use instant or online messaging to hang out with friends at relatively high rates. Some 84% of older teens (ages 15-17) use instant messaging as a way to hang out with friends, substantially more than the 71% of 13- to 14-year-olds who do so. Overall, the differences between boys and girls who employ instant messaging with friends are not statistically significant, but girls are more likely to do so every day. About a third (32%) of teen girls use instant messaging on a daily basis to connect with friends, while for boys, that share is 23%. Along with girls and older teens, teens who have met a friend online are also avid users of these services: 87% of teens who have made a friend online turn to instant or online messaging to spend time with friends, compared with 68% of teens who have never met a friend online. Overall, 52% of American teens spend time talking with their friends while playing video games together. 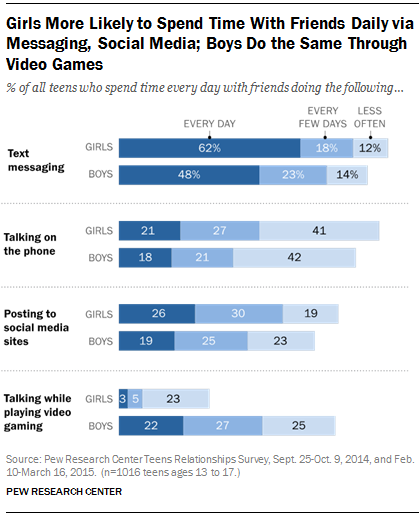 While girls communicate with friends daily via texting, social media and instant messaging more often than their male peers, boys are much more likely than girls to talk with friends while playing video games. Fully 74% of teen boys say they communicate with friends while playing video games, compared with almost a third (31%) of girls. There is also a sizeable gender gap in the frequency with which teens spend time together while gaming. About one-in-five boys (22%) say they talk daily with friends while playing video games, but only 3% of girls do so. Email is still a tool used by teens to talk with friends, but not with great frequency. Roughly two-thirds (64%) of teens ever use email to connect with friends. Just 6% of teens communicate with friends over email on a daily basis, while 43% say they spend time with friends over email monthly or less often. Teens from more affluent households and whose parents have higher levels of education are more likely than other teens to use email to connect with friends. For example, 71% of teens whose parents have a college degree communicate via email with friends, compared with 56% of teens whose parents have a high school diploma or less. Roughly two-thirds (67%) of teens whose annual household income is $50,000 or greater turn to email to hang out with friends. This compares with 56% of teens from households earning less than $50,000 a year. Like email, a majority of teens spend time with friends, at least occasionally, using video chat — 59% do so. But, also like email, few teens make video chatting an integral part of how they communicate with friends: Just 7% video chat with friends on a daily basis. Sharing passwords has long been about displaying trust and closeness among friends. One-in-five teens (19%) report that they have shared a password with a friend. 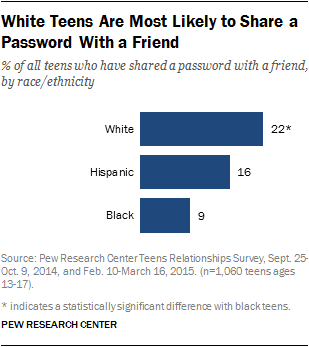 White teens are more likely than black teens to have shared one of their passwords with a friend; 22% of white teens and 9% of black teens say they have shared passwords. The 16% of Hispanic youth who have shared passwords are not significantly different from either white or black youth in their likelihood of sharing. There are no significant differences for teens who share passwords by gender, age group, household income, parents’ education or community type. As the number of social media sites a teen uses grows, so too does their likelihood of sharing passwords with friends. 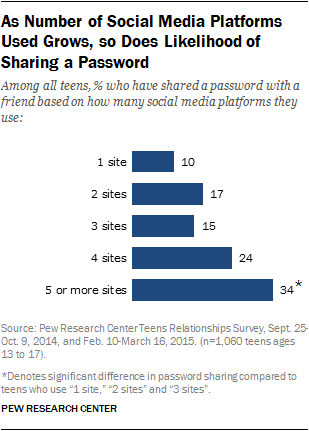 Among teens who use two or more sites, 23% report sharing a password. By comparison, among those who use less than two social media sites, only 11% have shared a password. Teens who use five or more sites are among the most likely to have shared a password with a friend — 34% have done this. Other teens take a more nuanced approach, “Nooooo, haha. I’ve let my friends on my account when I was around, but letting them have the password would expose my personal life too much,” said one high school boy.